Hush money -- Maybe - CHARTER SCHOOL WATCHDOG http://www.charterschoolwatchdog. We are still stuck on the -- $2000.00 or $2500.00 bonus that Lynda Galloway received (depending on the salary schedules or the Board minutes,). At first we thought that Galloway might just be an innocent pawn in the green card scam (in which Akkaya had to be the Science Department Head versus Galloway -- read "Identity Crises -- Part 2"). But then there's that email between Galloway and Murat Sagnak (another player in the Identity Crisis series), dated August 28, 2008. 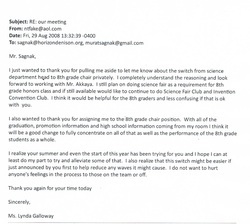 I just wanted to thank you for pulling me aside to let me know about the switch from Science Department head to 8th grade chair privately. I completely understand the reasoning and look forward to working with Mr. Akkaya." We are so glad that Galloway can "understand the reasoning, " perhaps she can share it with us, because we have dozens of resumes obtained through the EEOC Freedom of Information Act, of really qualified applicants for both the Science Department Head and Dean of Academics positions that were ultimately filled by Akkaya and Sagnak. The rest of the email can be read in its entirety below. 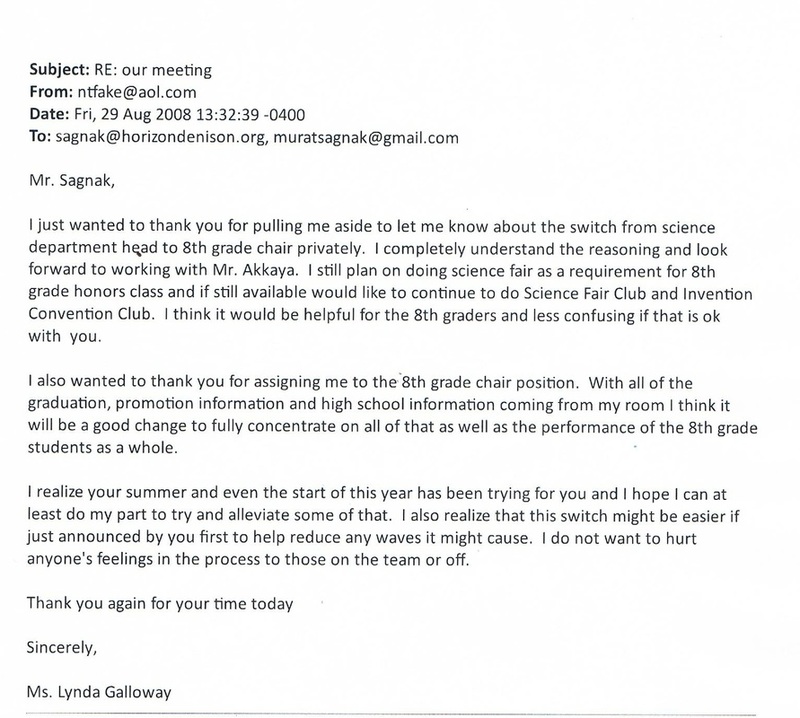 And then in November 2008, Sagnak asks the Board to give Galloway a $2000.00 bonus for her "extra-curricular" work. Okay - that's plausible, but the timing is somewhat suspect. Clearly we hope that Galloway was just a naive bystander and not an active participant in Hakkaya's and Sagnak's scam, because if she had knowledge and did not report it -- that would not be a very ethical or legal thing to do -- would it?